We have always dreamed of coming to this place since visiting California a few times during conference trips to the U.S. and even afterwards while living and working in San Diego. But it was not until a few days before our return to the Philippines did we finally get to see Lake Tahoe. It might have taken the better part of the day to get there from our Southern California abode but it was well worth the trip. Driving along Highway 50 to reach Lake Tahoe took us right into the El Dorado National Forest with views such as this one. Lake Tahoe is faintly visible on the upper left background. 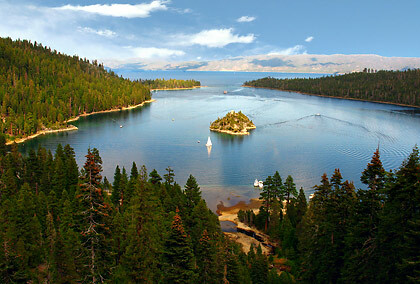 An alpine lake with crystal-clear waters framed by dense evergreen forests and the snow-capped mountains of the Sierra Nevada, Lake Tahoe is located at the junction of the states of Nevada and California. Ski resorts are a major tourist attraction during winter while various forms of summer recreation also draw in crowds during the warmer months. There are even casinos (on the Nevada side of the lake) along with golf courses, shopping and fine dining destinations. We of course prefer a quiet interaction with nature and Lake Tahoe does not disappoint with the kind of lake and mountain scenery that you can observe from the pictures here. 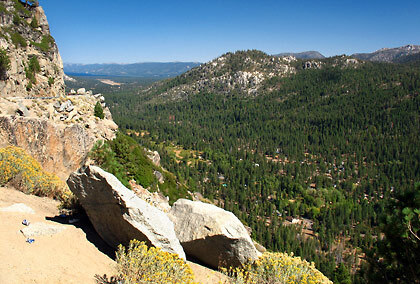 We entered Lake Tahoe from the south side, intent on driving the 72-mile loop around the lake. 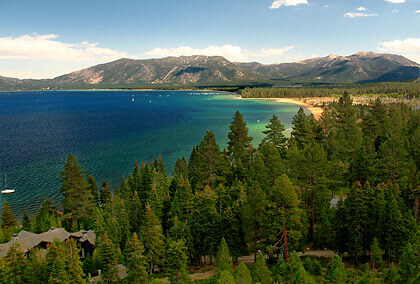 The first leg of the tour – the South Shore – is a somewhat “overdeveloped” stretch since most of the entertainment in Lake Tahoe is situated in this area. (The casinos on the Nevada side of the lake are located here.) The first beaches we encountered while driving up towards the western side of the lake – Reagan Beach and El Dorado Beach – are not as beautiful as other beaches elsewhere although both have nice lakeside parks. before driving around the lake. The view changes dramatically though as we drive along the elevated portion of Highway 89 northwards toward Emerald Bay. With its deep green water, surrounding evergreen forest and the only island in all of Lake Tahoe - Fannette Island – Emerald Bay is undoubtedly the most photographed location in the lake. View of Lake Tahoe’s South Shore from an elevated highway on the way to Emerald Bay. 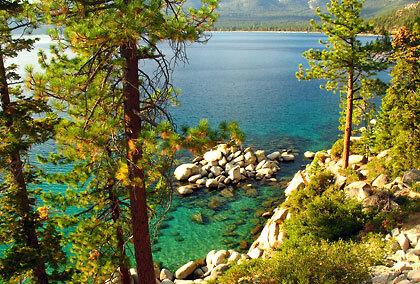 Emerald Bay is undoubtedly the most photographed location in Lake Tahoe. Hanging out at Emerald Bay Lookout – a great vantage point from which to take pictures – allowed us to get a closer glimpse of Fannette Island. We could also spot Vikingsholm Castle at the head of the bay. Built in 1929, Vikingsholm is an interesting replica of a medieval Scandinavian castle. It’s actually a throwback to the early part of the 20th century when vacationers from the Bay Area built huge summer homes and resorts along the scenic shores of Lake Tahoe. Fel Yturralde, our companion on this trip, reminisced about his childhood times when he and his relatives used to spend their summers in their lake vacation home. 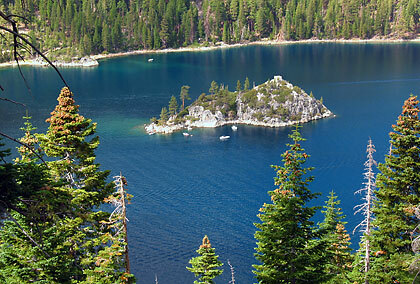 Fannette Island, the only island in Emerald Bay as viewed from Emerald Bay Lookout. Continuing up Highway 89 along the eastern shore towards Meeks Bay, we pass beside Sugar Pine State Park, the largest of the lake's parks and also the only one that has year-round camping. Driving further up north and still along the eastern shore brings us to Sunnyside and Tahoe City. 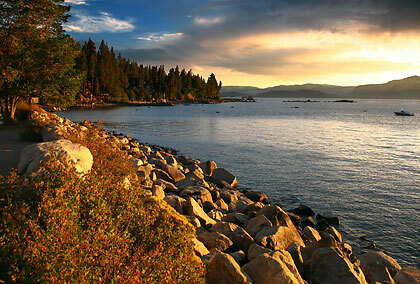 A favorite among art lovers, Tahoe City is where one can find several art galleries selling paintings of Lake Tahoe’s vistas..
A rocky beach at Crystal Bay just inside the Nevada state line. Our drive along the northern shore just after King’s Beach brought us to Crystal Bay and the Nevada side of the lake. (You know you’re on the Nevada side once you encounter a casino.) Incline Village, located along the shores of Crystal Bay, is probably the most beautiful community in the lake. 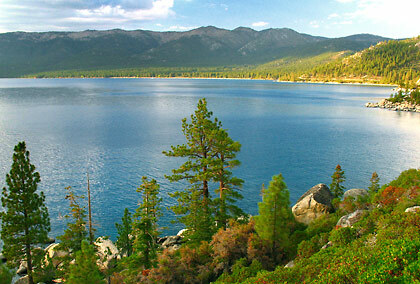 Driving past Incline Village brought us to the eastern shore of the lake – the most undeveloped and scenic part of Lake Tahoe with the exception of Emerald Bay. The lake’s turquoise waters and boulder-strewn beaches on the East Shore are a sight to behold. Lake Tahoe’s turquoise waters on display just south of Crystal Bay, East Shore. A few miles further south but still along the East Shore is beautiful Sand Harbor, famous for its white sand. We were somewhat surprised by the sand color, thinking that white sand is the exclusive domain of tropical beaches. 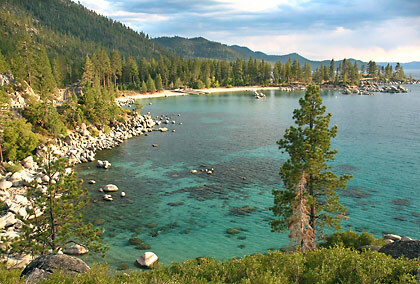 While most of the beaches here on the East Shore are of rocks or coarse-grained sand, Sand Harbor is famous for its relatively fine-grained sand deposited by Lake Tahoe’s prevailing breezes. 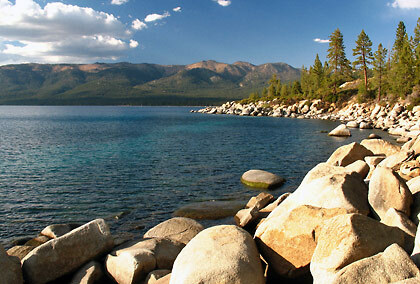 Sand Harbor on the eastern shore (Nevada side) is one of the most scenic views in Lake Tahoe. It was getting dark by the time we left Sand Harbor. When we got to Secret Harbor we headed up the beach in time to watch the spectacular sunset. It was evening when we took the exit through Highway 50 and on to Highway 395 and Reno, Nevada, where we would spend the night. That famous highway is another story but as we made our way to Reno, we could only smile at our good fortune to finally visit an alpine lake we have been dreaming about for years. 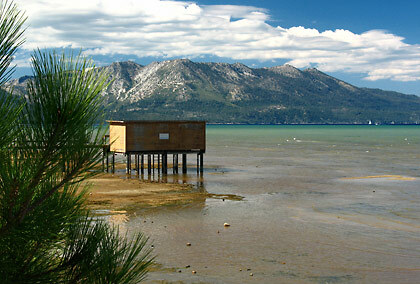 A picture of tranquility: Lake Tahoe’s eastern shore is largely undeveloped and very scenic.